For other people named Albert Kahn, see Albert Kahn (disambiguation). Albert Kahn (March 21, 1869 – December 8, 1942) was the foremost American industrial architect of his day. He is sometimes called the "architect of Detroit". In 1943, the Franklin Institute awarded him the Frank P. Brown Medal posthumously. Kahn was born to a Jewish family on March 21, 1869, in Rhaunen, Kingdom of Prussia. Kahn immigrated with his family to Detroit in 1880, when he was 11. His father Joseph was trained as a rabbi; his mother Rosalie had a talent for the visual arts and music. As a teenager, Kahn got a job at the architectural firm of Mason and Rice. In 1891, he won a year's scholarship to study abroad in Europe, where he toured Germany, France, Italy, and Belgium with Henry Bacon, another young architecture student. Bacon later designed the Lincoln Memorial in Washington, D.C.. In 1895, he founded the architectural firm Albert Kahn Associates. Together with his younger brother Julius, he developed a new style of construction whereby reinforced concrete replaced wood in factory walls, roofs, and supports. This gave better fire protection and allowed large volumes of unobstructed interior. Packard Motor Car Company's factory, designed in 1903, was the first to be built according to this principle. The success of the Packard plant interested Henry Ford in Kahn's designs. Kahn designed Ford Motor Company's Highland Park plant, begun in 1909, where Ford consolidated production of the Ford Model T and perfected the assembly line. Kahn later designed, in 1917, the massive half-mile-long Ford River Rouge Complex in Dearborn, Michigan. The Rouge developed as the largest manufacturing complex in the United States and, in its time, in the world. Its workforce peaked at 120,000 workers. Kahn was responsible for many of the buildings and houses built under direction of the Hiram Walker family in Walkerville, Ontario, including Willistead Manor. Kahn's interest in historically styled buildings is also seen in his houses in Detroit's Indian Village, the Cranbrook House, the Edsel and Eleanor Ford House, and The Dearborn Inn, the world's first airport hotel. Kahn also designed the 28-story Art Deco Fisher Building in Detroit, now a landmark and considered one of the most beautiful elements of the Detroit skyline. In 1928, the Fisher building was honored by the Architectural League of New York as the year's most beautiful commercial structure. Between 1917 and 1929, Kahn designed the headquarters for all three major daily newspapers in Detroit. On May 8, 1929, through an agreement signed with Kahn by President of Amtorg Saul G. Bron, the Soviet government contracted the Albert Kahn firm to design the Stalingrad Tractor Plant, the first tractor plant in the USSR. On January 9, 1930, a second contract with Kahn was signed for his firm to become consulting architects for all industrial construction in the Soviet Union. Under these contracts, during 1929–1932, Kahn's firm operated from its headquarters in Detroit and the newly established design bureau in Moscow to train and supervise Soviet architects and engineers. The bureau Gosproektstroi was headed by Albert Kahn's younger brother, Moritz Kahn, and 25 Kahn Associatese staff were involved in Moscow in this project. They trained more than 4,000 Soviet architects and engineers; and designed 521 plants and factories under the first five-year plan. Kahn also designed many of what are considered the classic buildings at the University of Michigan in Ann Arbor. These include the Burton Memorial Tower, Hill Auditorium, Hatcher Graduate Library, and William L. Clements Library. Kahn said later in life that of all the buildings he designed, he wanted most to be remembered for his work on the William L. Clements Library. Kahn frequently collaborated with architectural sculptor Corrado Parducci. In all, Parducci worked on about 50 Kahn commissions, including banks, office buildings, newspaper buildings, mausoleums, hospitals, and private residences. Kahn's firm was able to adapt to the changing needs of World War I and designed numerous army airfield and naval bases for the United States government during the war. 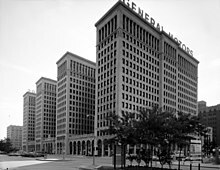 By World War II, Kahn's 600-person office was involved in making Detroit industry part of America's Arsenal of Democracy. Among others, the office designed the Detroit Arsenal Tank Plant, and the Willow Run Bomber Plant, Kahn's last building, located in Ypsilanti, Michigan. The Ford Motor Company mass-produced Consolidated B-24 Liberator bombers here. In 1937, Albert Kahn Associates was responsible for 19 percent of all architect-designed factories in the U.S. In 1941, Kahn received the eighth highest salary and compensation package in the U.S., $486,936, on which he paid 72% in tax. Albert Kahn worked on more than 1,000 commissions from Henry Ford and hundreds for other automakers. Kahn designed showrooms for Ford Motor Company in several cities including New York, Washington, D.C., and Boston. He died in Detroit on December 8, 1942. As of 2006, approximately 60 Kahn buildings were listed on the National Register of Historic Places. Not all of Kahn's works have been preserved. Cass Technical High School in Detroit, designed by Malcomson and Higginbotham and built by Albert Kahn's firm in 1922, was demolished in 2011 after vandals had stripped it of most of its fixtures. The Donovan Building, later occupied by Motown Records, was abandoned for decades and deteriorated. The city demolished it as part of its beautification plan before the 2006 Super Bowl XL. He is not related to American architect Louis Kahn of Philadelphia, Pennsylvania. All buildings are located in Detroit, unless otherwise indicated. ^ Albert Kahn papers "he also received the Frank P. Brown medal posthumously"
^ a b c d e f g Johnson, Donald L. and Donald Langmead (1997). Makers of 20th Century Modern Architecture: A Bio-Critical Sourcebook. Fitzroy Dearborn Publishers. ISBN 1136640568. Pp. 161-164. ^ Borth, Christy. Masters of Mass Production, Indianapolis, IN: Bobbs-Merrill Co., 1945, pp. 97-100. ^ "About Kahn-What". albertkahn.com. Archived from the original on May 27, 2011. Retrieved October 29, 2010. ^ Ferry 1970, p. 11. ^ Borth, Christy. Masters of Mass Production, pp. 107-8, Bobbs-Merrill Co., Indianapolis, IN, 1945. ^ Herman, Arthur. Freedom's Forge: How American Business Produced Victory in World War II, pp. 22, Random House, New York, NY, 2012. ISBN 978-1-4000-6964-4. ^ a b Melnikova-Raich, Sonia (2010). "The Soviet Problem with Two 'Unknowns': How an American Architect and a Soviet Negotiator Jump-Started the Industrialization of Russia, Part I: Albert Kahn". IA, The Journal of the Society for Industrial Archeology. 36 (2): 59–73. ISSN 0160-1040. JSTOR 41933723. ^ "Industry's Architect". Time. June 29, 1942. Retrieved 2008-04-04. In 1928 the Soviet Government, after combing the U.S. for a man who could furnish the building brains for Russia's industrialization, offered the job to Kahn. Twenty-five Kahn engineers and architects went to Moscow. They had to start from scratch. ^ Borth, Christy. Masters of Mass Production, pp. 109-10, 120-28, Bobbs-Merrill Co., Indianapolis, IN, 1945. ^ Herman, Arthur. Freedom's Forge: How American Business Produced Victory in World War II, pp. 51-2, 96-8, 148, 200, 227-9, 242, Random House, New York, NY, 2012. ISBN 978-1-4000-6964-4. ^ "Compensation and the I.R.S. : It's not the 'Good' Old Days". The New York Times. 2010-12-01. (Business Day section). Retrieved 2014-01-21. ^ Cass Tech High School (old). Historic Detroit. Retrieved on November 20, 2014. ^ Benjamin L. Gravel Jr. Frederick H. Holt House (250 East Boston Boulevard). Historic Detroit. Retrieved July 26, 2016. ^ "Plans at old Shaw Walker site". MLive. Retrieved July 31, 2017. ^ "Brad Flory column: Good-bye to a landmark once 'the essence of Jackson'". MLive. ^ "Chronicle Building now owned by Muskegon Community College". MLive. Retrieved July 31, 2017. ^ "Detroit Times Building". Buildings of Detroit. Archived from the original on 26 October 2010. Retrieved October 29, 2010. ^ "Alpha Epsilon Phi - ΑΕΦ | Greek Life". fsl.umich.edu. Retrieved 2018-05-25. Bridenstine, James (1989). Edsel and Eleanor Ford House. Wayne State University Press. ISBN 0-8143-2161-5. Ferry, W. Hawkins (1970). The Legacy of Albert Kahn. Detroit: Wayne State University Press. ISBN 0-8143-1889-4. Fogelman, Randall (2004). Detroit's New Center. Arcadia. ISBN 0-7385-3271-1. Matuz, Roger (2002). Albert Kahn, Builder of Detroit. Wayne State University Press. ISBN 978-0-8143-2956-6. Wikimedia Commons has media related to Albert Kahn. Albert Kahn papers 1896–2008 Bentley Historical Library, University of Michigan.